Chennai, the capital city of Tamil Nadu, has a happening nightlife and a number of discotheques, to add to its glitz and glamour. These discotheques provide you an opportunity to set the floor on fire and have a rocking night experience. As the sun goes down, the spirit of the falling dark engulfs the, otherwise, historic city of Madras and its people, to lure them into pleasurable activities. There are many options available in the city to enliven your late night hours, such as pubs, discos, lounges, etc. Here, you can groove on some foot tapping numbers amidst revolving lights, colorful people and chill bars, which make the environment intoxicating, forcing you to want more. HFOHFO is the most popular discotheque in Chennai. With 6000 sq. 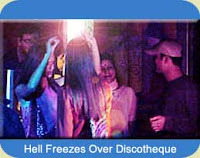 feet of floor space, 2500 watts of music, state-of-the-art sound and lighting systems, billiards table, bar for members and non-members, the choicest liquors, the great music, 3 super-cool DJs and a simply electrifying atmosphere, it literally stands up to its name HFO (Hell Freezes Over). A special ladies night takes place on Wednesdays, while two Saturdays a month are dedicated to events like Fashion Shows, Bacardi Nights, Coke Nights, etc. Moreover, Guest DJs from all over the country are invited to play here. DublinDublin is a chic class pub and has become a hot spot in the city. It is situated in the premises of ITC Hotel Park Sheraton. The pub is a fine blend of Irish pub/nightclub. PashaPasha is a jazzy discotheque, which allows you to relax in low divan-styled seating areas and sink into plush silky cushions in myriad colors. To hide out from the frantic activity, you can veil yourself in a maze of metallic organza drapes. You can also enjoy an Indipop evening, which spikes up the atmosphere every Wednesday. This place is hot and lives up to its name (Hell Freezes Over) with 6000 sq. feet of floor space, 2500 watts of music, state-of-the-art sound and lighting systems, a billiards table, a members-only and a non-members bar, the choicest liquors, the great music, 3 super-cool DJs and an atmosphere that is simply electrifying. On par, in quality, with other nightclubs around the world, yet priced reasonably, HFO is the place to be. You can party all week long. Do not miss Friday and Saturday nights for that is when HFO is really happening. There is also an exclusive Ladies Night on Wednesdays. Two Saturdays, a month, are dedicated to special events that include Fashion shows, Bacardi nights, Coke nights, etc. Guest DJs from all over the country are invited to play here. DublinA swanky pub. Dublin is the latest hotspot a combination of Irish pub/nightclub at Park Sheraton. ITC Hotel Park Sheraton and Towers 132, TTK Road .PashaThe Park, 601 Anna Salai Recline into the low divan-styled seating areas and ease into silky cushions in myraid colours. A maze of metallic organza drapes create perfect hide-aways in the midst of frenzied activity. Each Wednesday, an Indipop evening sets the floor on fire. A visiting DJ spikes up the atmosphere.EC4141 East Coast Road. Open on Saturday only. The Leather BarThe Park Chennai, 601 Anna Salai Geoffrey'sHotel Radha Park Inn, 171, Jawaharlal Nehru Salai (Inner Ring Road) Great music, Exotic drinks, Ladies' nights. Gourmet pub food. Happy Hours - it's all happening here. Rights of admission reserved. Dress code applies. Munro (The Sindoori Central Hotel)26/27 Poonamalle High Road Zara - Tapas Pub74, Radhakrishna Salai An exciting mix of cocktails, tantalizing Spanish snacks and great music to elevate your already soaring spirits, and ambience that will take you to the skies. That is ZARA, The place to be in.Fort St George (Taj Coromandel)37 M G Road.Arguably the most popular watering hole in town, Fort St. George is located at the lobby level of Taj Coromandel.